I created the background using some Tim Holtz Distress Inks and water, i also used a couple of stencils. All the stamps on this tag are by Dreamees. 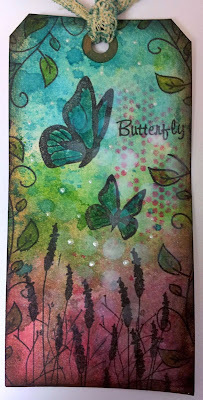 I used Silhouette Butterfly Stamp Set & Swirl Vine Stamp. Did you know you can pick up both these stamps for only £4.50? A total bargain!